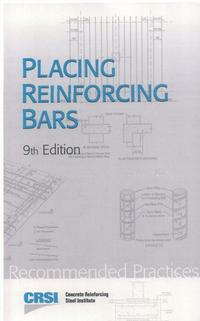 This book presents the best-accepted current practices in placing reinforcing bars, bar supports and welded wire fabric. it is written primarily for those actually engaged in placing reinforcing steel. It will also serve as a guide to the Field Inspector in judging workmanship and in making field adjustments. This book is required for the Florida State Certified Contractor's exams for General, Builder and Residential.